“Through the process of making Virtual Drag we discovered that drag offers some interesting ways of rethinking virtual reality. The intersections between virtuality and drag stem from ways of speaking about virtual reality as simulation and the drag definition of ‘realness’. Chaired by Joshua Morrison, Bennett will be joined on the SXSW panel by artists Illya Szilak and Liss LaFleur. Szilak’s current VR project in development, Atomic Vacation, is an innovative transmedia narrative game. The gorgeous trailer, developed at BANFF Arts Center in Canada with master animator Sasha Stanojevic, gives a tantalizing preview of this virtual reality game. Recent work in progress videos and images on the Atomic Vacation Facebook page give a taste of this exciting work. Szilak’s earlier interactive online novel QueerSkins, is also in the process of being developed as a virtual reality work. “Queerskins explores the nature of love and justice through the story of a young gay physician from a rural Midwestern Catholic family who dies of AIDS at the start of the epidemic. Queerskins’ interface consists of layers of sound, text, and image that users can navigate at random or experience as a series of multimedia collages. Images of the mythic and the everyday, the sacred and the profane, from banal vacation footage to vintage burlesque, interact rhizomatically with text and audio monologues to subvert preconceived notions of gender, sexuality, and morality”. The panel will discuss themes that underpin the intersection of queer theory with the emerging media of virtual reality and discuss a number of virtual reality works made by queer new media artists. 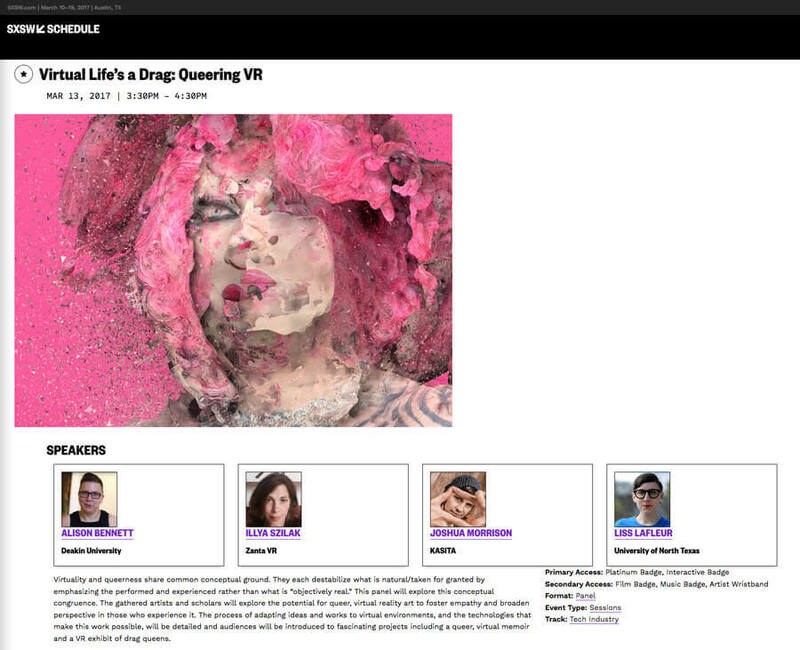 RSVP to the Facebook event for #SXSW2017: Virtual Life’s a Drag: Queering VR for updates and teasers in the lead up to this exciting #SXSW2017 panel!